Today was a perfect opp to get on course early and ride the finale kms of the day, intending to report back to the mighty PEZ-Faithful what the closing miles of today’s stage are really like. See that snow covered mountain? That ain’t snow Buckwheat, that’s what’s inside the mountain when they mine off the glorious marble that’s likely sitting on your kitchen counter. Of course this didn’t actually happen, but it did actually ‘almost happen’. And it might have ‘really happened’ if not for the rains of doom that descended on me just minutes from my car. How many times have I written this: my plan seemed simple enough, yet in the end, my idea to ride the closing kms of today’s corsa failed to materialize, but the consolation prize was one for the history books. 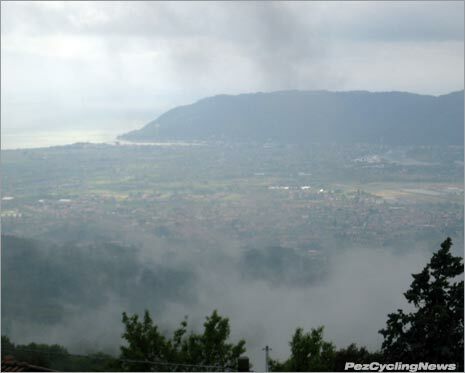 Driving down from Sestri Levante the skies looked promising for – dare I say it – a great day on the bike. 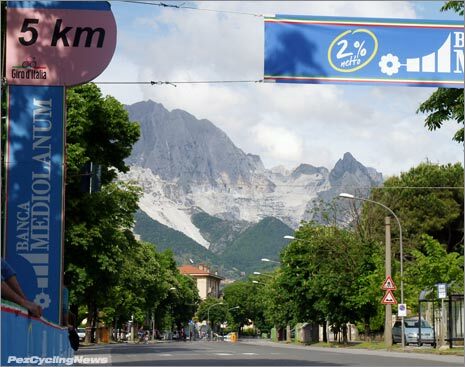 I even made great time down to the finish town of Carrara – very possibly the birth place of that gorgeous granite counter top you and your better half spent so much time researching, discussing, and finally buying what she wanted. But trouble was a-brew even as I took one of the first spots in the ‘parcheggio per stampa’ – the pitch black clouds we’d been deluged by back in Savigliano were clear and present – dangerous indeed. Look closely and you’ll see what’s in reality a ‘wall of water’ about to make land. 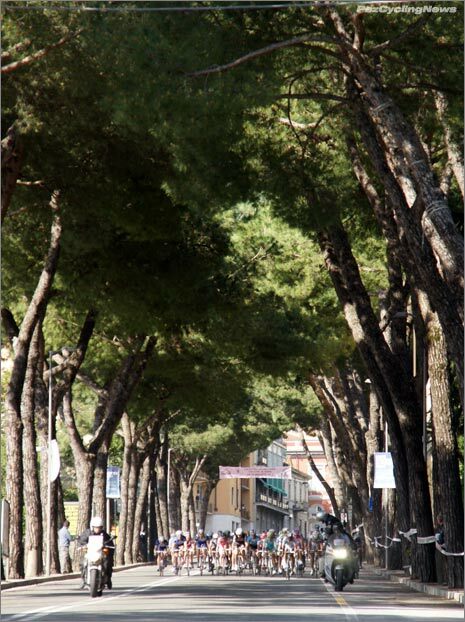 But a roadside adventure would not be denied, and within minutes I was suited and on the bike, heading for a quick stop on the promenade that hosts some of the most popular beaches of the Italian summer. The big diff today was that this was decidedly un-summerlike. As I snapped the pic above, the first big drops of rain plopped onto my corpus, and before I could pull on my lightweight GORE rain jacket, I was wet enough to be nervous. Within minute – and yes, I mean less than 1 - the skies had opened to unleash a biblical-sized storm meant to cleanse – or drown – all in her path. 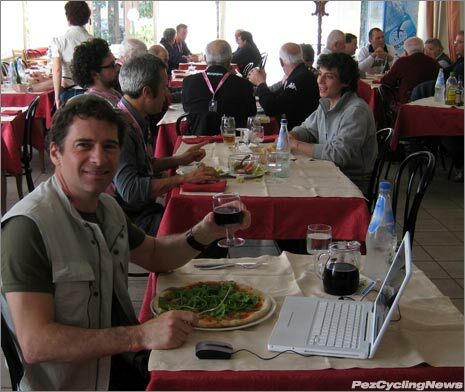 Not wanting to perish this early into the ride, I sought refuge in a local cafe, while the Giro roadies donned their rain jackets and got on with the job of building the finish line structures. 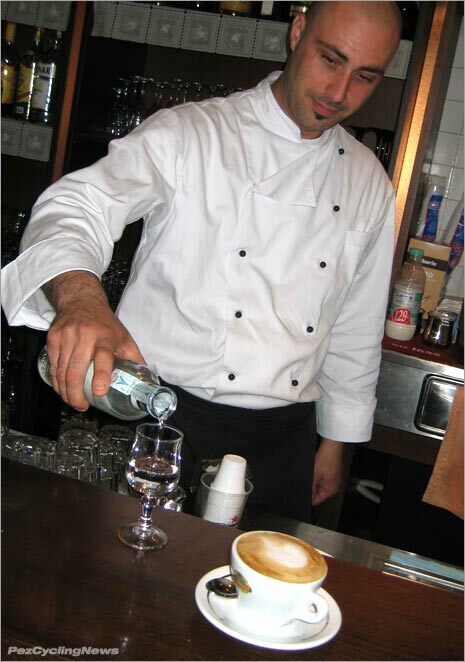 Fortification was clearly needed, so I asked for a ‘grappa morbibo’ to accompany my cappuccino. The barman kindly obliged – even heading into the cellar to procure a bottle to suit my request. See those rain drops I’m wearing.. that’s about 60 seconds worth of the wettest stuff I’ve seen since, well, stage 4. But the beauty of these rolling storms is they clear almost as fast as the appear, so it wasn’t long before I was poised for take off on a day I’d been looking forward to all week. I set off in a northerly direction, intending to intersect the corsa and ride in the last 30ish kms to the finish. 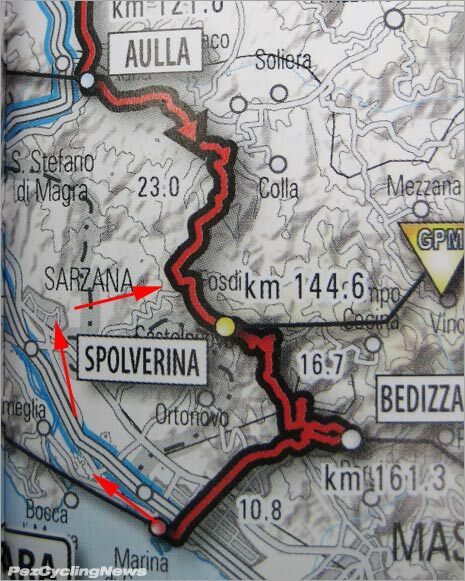 The roads were wet, and I was glad I’d pulled on my Capo winter leg warmers, but the wind was at my back and I made good time on the flat 10kms north to Sarzana, where I’d source some smaller roads (and follow the signs) to intersect the course. 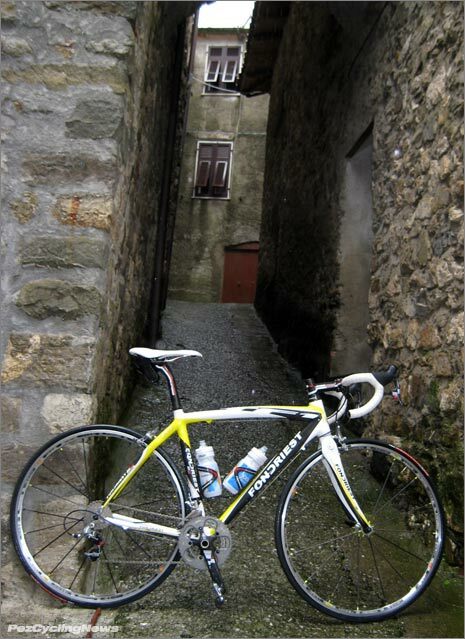 The well signed Italian roads played to my favor – or so I thought, as I easily found the signs I needed and steered a course through Sarzana in the direction of Fosdinovo – not exactly on the corsa, but close enough that I’d find it from there. Giucano - smaller than it looks. Heading into the mountains, my mood dampened only - but only slightly – as I felt a few more rain drops descend from the darkening skies. That ugly, almost pitch black sky was back – and I was headed right for it – or vice versa. But the road steepened, and even as the drops turned to rain, the 4-5% climb was enough to keep me warm and turning the pedals. Up ahead I spotted a small town – Giucano – and new I was on the right road. 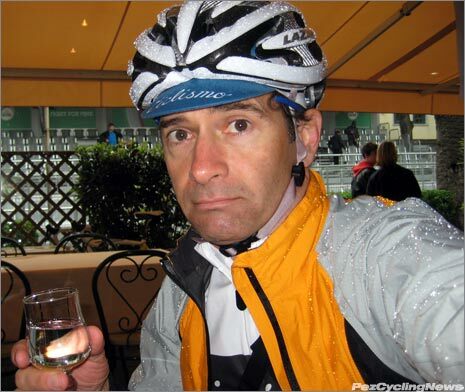 Soon after though – the rain turned to the heavy stuff once again – heavy enough to warrant an unscheduled stop in Giucano where a hot coffee would be a welcomed refreshment. Giucano – that’s not a sidewalk, it’s an actual street. Too bad Giucano was closed today. I thought I’d find something in the town square, but as I slipped my way up the steep sidewalk-sized streets, I soon determined that there was no town square. More than a few minutes of sliding around in cleated feet were enough to log this as a bad idea, and I eventually made my escape. I continued my climb, and the rains came harder. How hard you ask? Here’s a good illustration for you at home… take your trainer and place it in one of those big showers with the nozzles all over the sides. 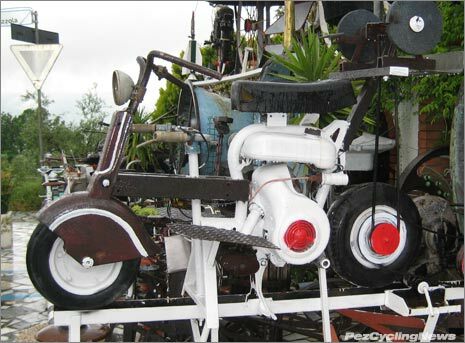 Hop on and start pedaling, then turn on the shower full blast. Make sure it’s cool water. Now get your wife to pour some buckets of water over top of the shower door. Continue for 45 minutes. Yup. It was bad. 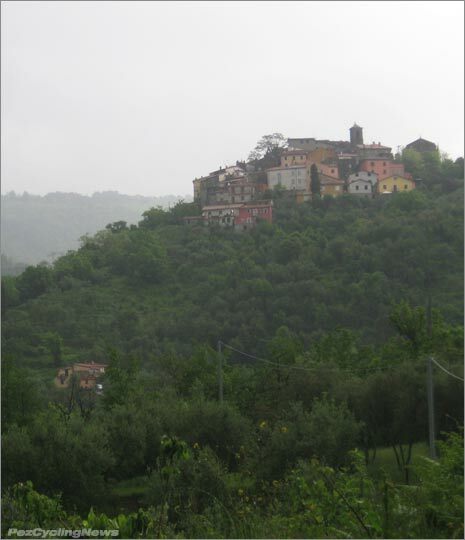 I finally made it to Fosdinovo – but after riding through torrents of water gushing down the sides of the road. I would have taken some pics for you, but was afraid the camera would drown. Pouring rain behnd me - sun ahead. Which direction would you choose? And when I reached Fosdinovo, I didn’t actually know it was Fosdinovo, so I pulled the pin and headed for dryer space. 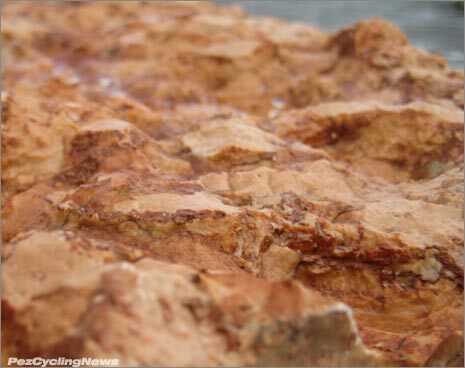 I rounded one corner and was treated to this tempting view of where the dry was… the calling was strong and I sadly pointed the bike down hill. 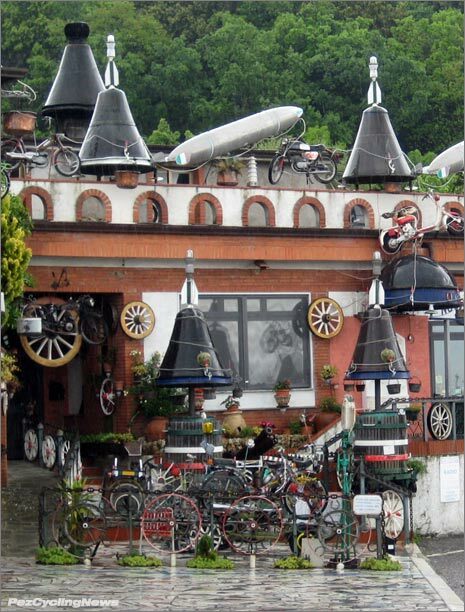 Somewhere down the hill, I came across this pizzeria with a most unusual art collection. There were literally dozens of ‘art-ified’ bikes, scooters, mopeds and other velocipedes. 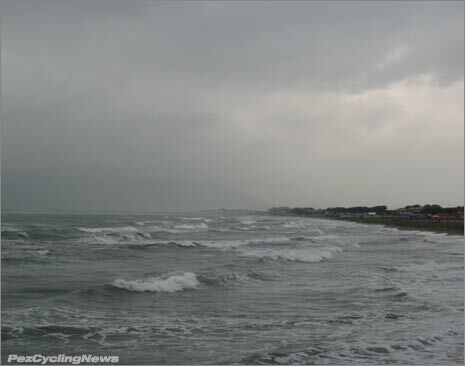 I really wanted to stay, but being soaked through and cold, I resolved to get myself back to safety first. And as soon as I hit the flat lands, the sun came back out and the rain stopped. I could even see the clouds clearly on the climbs I’d hoped to do. How’s that for a stick in the eye? But rolling along the flat roads back to Carrara (and some dry clothes), I chanced upon a sight you just don’t see every day. 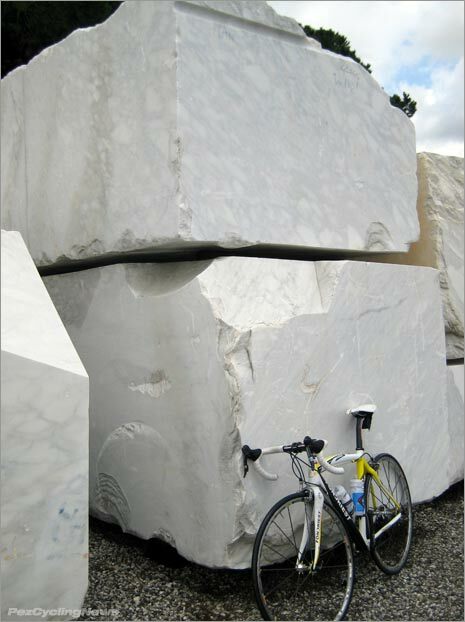 Huge blocks of the white stuff cut from the local mountains. They bring these down the twisty mountain roads on the backs of flatbed trucks…- I’d love to have the brake-repair contract for those guys. By 2:30 I was dry, and digging into a pizza while sorting through pics for today’s story. Happy again – as you can see. Then it was onto the course to see the race come in, and look for that location where no one else would be. I’d hoped to get the mountains in the background, but instead chose this long tree-shrouded section of the run-in to Carrara, about 6kms to go. Matt Lloyd flew by solo, with PEZ-Pal Rubens Bertogliati a few seconds later – their finishing order sealed. Overall – it wasn’t the day I’d expected, but how can I complain – I got in a good ride, the sun came out, I saw the race, and I’m a lot closer to home than last time. Tomorrow Ed & Martin take over as the race heads inland and to the ‘strade bianca’, and if all goes as planned – Ed and I will actually meet for the first time since he joined the Pez-Crew about 5 years ago… That will be quite a moment. Alessandro and Matt will take us into the final week, and I’ll be back for the Dolomites – so stick around as there’s plenty more to come.